Every knowledge structure used for knowledge representation (KR) or knowledge-based artificial intelligence (KBAI) needs to be governed by some form of conceptual schema. In the semantic Web space, such schema are known as “ontologies”, since they attempt to capture the nature or being (Greek ὄντως, or ontós) of the knowledge domain at hand. Because the word ‘ontology’ is a bit intimidating, a better variant has proven to be the knowledge graph (because all semantic ontologies take the structural form of a graph). In Cognonto‘s KBAI efforts, we tend to use the terms ontology and knowledge graph interchangeably. 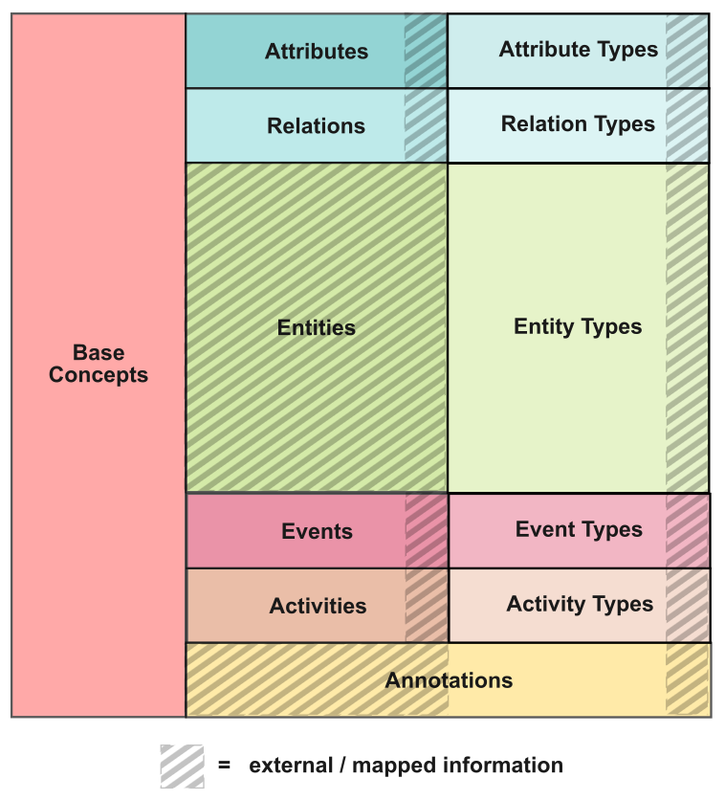 Cognonto uses the KBpedia Knowledge Ontology (KKO) as its upper conceptual schema. KKO is the structure by which Cognoto’s hundreds of thousands of reference concepts and millions of entities are organized . This article presents an overview and rationale for this KKO structure. Subsequent articles will delve into specific aspects of KKO where warranted. 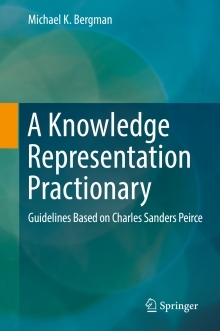 The upper structure of the KBpedia Knowledge Ontology (KKO) is informed by the triadic logic and basic categories of Charles Sanders Peirce. If the relation of this triadic design to knowledge representation appears a bit opaque, please refer to the introduction of this series in the prior article, The Irreducible Truth of Threes. The key point is that ‘threes’ are the fewest by which to model context and perspective, essential to capture the nature of knowledge. Thirdness [3ns] — these are the laws, habits, regularities and continuities that may be generalized from particulars. All generals — what are also known as classes, kinds or types — belong to this category. The process of finding and deriving these generalities also leads to new insights or emergent properties, which continue to fuel knowledge discovery. Insights arising from Thirdness enable us to further explore and understand things, and is a driving force for further categorization. Peirce argues persuasively that how we perceive and communicate things requires this irreducible triadic structure. The symbolic nature of Thirdness means that communication and understanding is a continuous process of refinement, getting us closer to the truth, but never fully achieving it. Thirdness is a social and imprecise mode of communication and discovery, conducted by us and other agents separate from the things and phenomena being observed. Though it is a fallibilistic process, it is one that also lends itself to rigor and methods. The scientific method is a premier example of Thirdness in action. What constitutes the potentials, realized particulars, and generalizations that may be drawn from a query or investigation is contextual in nature. That is why the mindset of Peirce’s triadic logic is a powerful guide to how to think about and organize the things and ideas in our world (that is, knowledge representation). Peirce’s triadic logic and views on categorization are fractal in nature. We can apply this triadic logic to any level of information granularity. Thus, KKO applies this mindset to organizing its knowledge graph. At each level in the KKO upper structure, we strive to organize each category according to the ideas of Firstness (1ns), Secondness (2ns) and Thirdness (3ns), as shown in the upper KKO structure below. Now armed with a basic conceptual and logical grounding, what are the main kinds of distinctions we want to capture in our knowledge structure? Since our purpose is to provide a means for integrating knowledge bases (KBs) of use to artificial intelligence (AI), or KBAI, the answer to this question resides in: 1) what conceptual distinctions are captured by the constituent KBs; and 2) what kinds of work (AI) we want to do with the structure. We will be talking about specific vocabulary items above in subsequent articles. One important distinction to draw for now, however, is the split between attributes and relations. In standard RDF and OWL ontologies these are lumped together as properties. In OWL, there is the further distinction of datatype and object properties, but these do not quite capture the difference we desire. In KBpedia, attributes are the descriptions or characteristics of a given entity (or its type); relations are the roles, connections or subsumptions between objects . Note that the three columns of this figure correspond to the three categories of potentials (1ns, left column), particulars (2ns, middle column) and generals (3ns, right column) described above. In terms of KBpedia, all of the instances of the knowledge structure, now numbering over 20 million in the standard version, are affiliated with the middle column (particulars). The classification aspects of KBpedia reside in the right column (generals). The reasoning aspects of KBpedia largely reside in the left and right columns (though reasoning work is also done on selecting and aggregating instances in the middle column) . More than 85% of the classification structure of KBpedia resides in the generals, or types, in the rightmost column. These, in turn, are organized according to a set of typologies, or natural classification structures. Unlike the KKO upper structure, each typology is not necessarily organized according to Peirce’s triadic logic. That is because once we come to organize and classify the real things in the world, we are dealing with objects of a more-or-less uniform character (such as animals or products or atomic elements). There are about 80 such typologies in the KBpedia structure, about 30 of which are deemed “core”, meaning they capture the bulk of the classificatory system. Another document presents these 30 “core” typologies in more detail. I have written elsewhere  about the basis for “natural” classification systems. These approaches, too, are drawn from Peirce’s writings. Natural classifications may apply to truly “natural” things, like organisms and matter, but also to man-made objects and social movements and ideas. The key argument is that shared attributes, including a defining kind of “essence” (Aristotle) or “final cause” (Peirce) help define the specific class or type to which an object may belong. For Peirce, what science has to tell us, or what social consensus settles upon, holds sway. If accomplished well, natural classification systems lend themselves to hierarchical structures that may be reasoned over. Further, if the splits between typologies are also done well, then it is also possible to establish non-overlapping (“disjoint”) relationships between typologies that provide powerful restriction and selection capabilities across the knowledge structure. We believe KBpedia already achieves these objectives, though we continue to refine the structure based on our mappings to other external systems and other logical tests. Of course, the purpose of all of this design is to provide a coherent, consistent, logical structure over which Cognonto may reason and link external data and schema. We will be discussing elsewhere the specific use cases and applications of this structure. For now, we wanted to set the stage for the design basis for KKO. This article will be a common reference to those subsequent discussions. The KKO upper structure may be downloaded and inspected in greater detail. 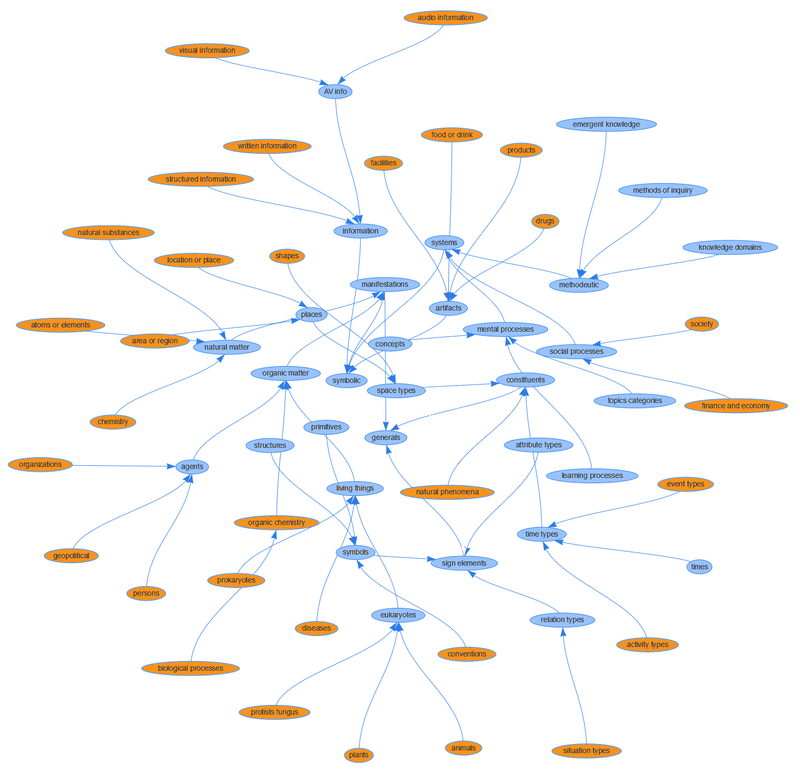 For an introduction to Cognonto and KBpedia, its knowledge structure, see M.K. Bergman, 2016. “Cognonto is on the Hunt for Big AI Game“, AI3:::Adaptive Information blog, September 20, 2016. See M.K. Bergman, 2016. “A Speculative Grammar for Knowledge Bases“, AI3:::Adaptive Information blog, June 20, 2016. See M.K. Bergman, 2015. “‘Natural Classes’ in the Knowledge Web“, AI3:::Adaptive Information blog, July 13, 2015. The KBpedia Knowledge Ontology combines an upper structure based on 'threes' in order to capture the contexts and perspectives of knowledge, with naturally "classed" typologies to organize the real things in the world.